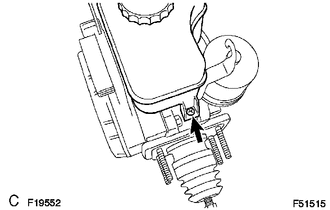 (a) Place the brake booster pump in a vise with a cloth. (b) Install the brake booster accumulator pipe, compression spring and a new O-ring. Ensure that no foreign matter enters the pump. 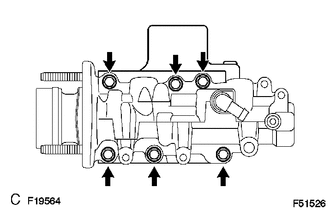 (c) Using a socket wrench (17 mm), install the brake booster accumulator onto the brake booster pump. 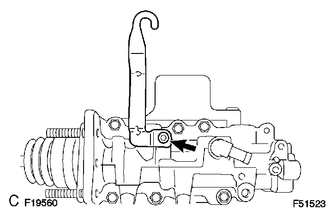 (a) Place a new gasket on the master cylinder solenoid and install them onto the master cylinder body with 6 new bolts. 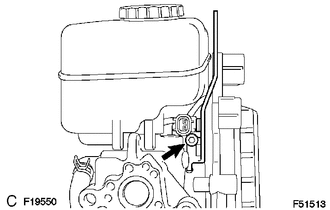 Do not let water, dust, and/or other objects attach to the surface and/or attaching surface of the master cylinder solenoid, master cylinder and body gasket. (a) Apply lithium soap base glycol grease to the new piston. 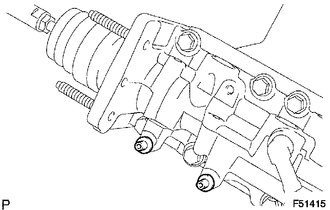 (b) Install the piston onto the master cylinder body. 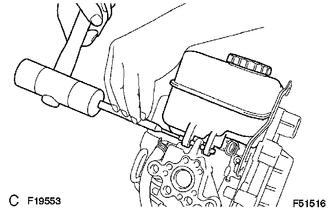 (c) Using 2 screwdrivers, install a new C-ring while pressing the piston. 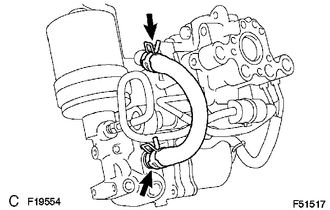 If the piston is pulled out at an angle, there is a possibility that the cylinder bore could be damaged. Be careful not to damage the rubber lips on the piston when reassembling. 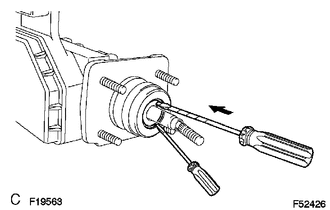 (a) Install the lock nut and master cylinder push rod clevis onto the rod operating adapter. 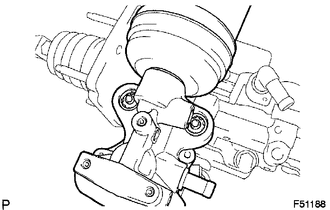 (b) Install the hydraulic brake booster side lock nut and rod operating adapter onto the hydraulic brake booster. (a) Using a hexagon wrench (5 mm), install the brake booster pump bracket with the 2 screws. (b) Install the bush onto the brake booster pump bracket. 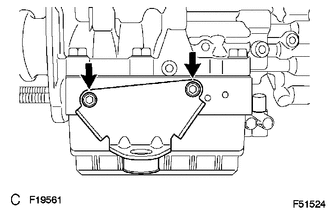 (a) Using a hexagon wrench (5 mm), install the brake actuator bracket with the screw. 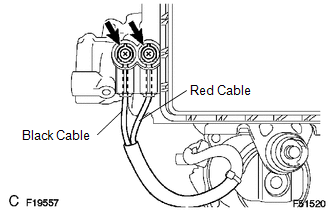 (a) Install the 2 collars and 2 bushes onto the brake booster w/ accumulator pump assembly. (b) Using a hexagon wrench (4 mm), install the 2 pins. (c) Install the brake booster w/ accumulator pump assembly. (d) Install a new clip. (e) Install the wire harness with the 2 screws. (f) Install the 2 new plugs. 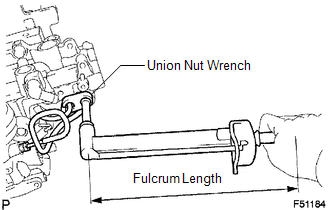 (a) Using a union nut wrench, install the brake actuator tube No. 1. (a) Using needle-nose pliers, install the brake actuator hose and 2 clips. (b) Apply lithium soap base glycol grease to the 3 new grommets. (c) Install the 3 grommets to the master cylinder body. Be careful of the size of each grommets. 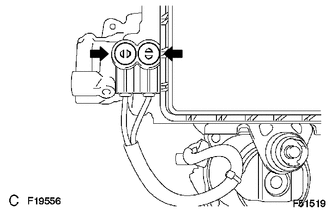 (d) Install the master cylinder reservoir. 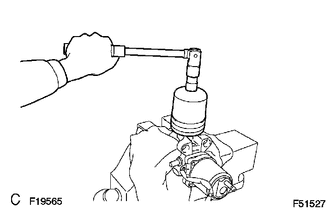 (e) Using a pin punch and hammer, install a new pin onto the master cylinder reservoir. (f) Install the screw onto the master cylinder reservoir. (a) Install the fluid level warning switch connector. 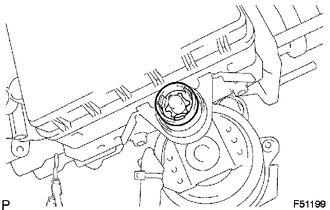 (b) Using a hexagon wrench (5 mm), install the brake actuator bracket No. 1 with the screw.